Today I would like to talk about Abebe Bikila, one of Africa’s finest athletes, who marked the entire continent by his strength, endurance, and love of his country, and continent. 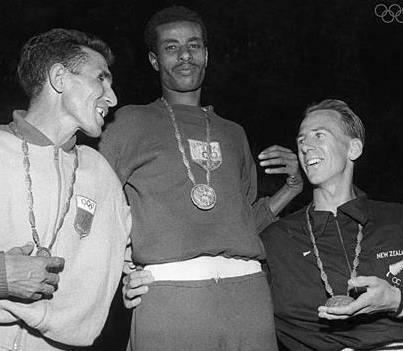 Abebe Bikila was an Ethiopian athlete and the very first African to win an Olympic gold medal in 1964 (remember that previous winners like Alain Mimoun from Algeria competed for France, since Algeria was still a French colony). Coincidentally born on the day of the 1932 Los Angeles Olympics, Abebe Bikila opened his eyes to the world in the small village of Jato, near the town of Mendida in Ethiopia. 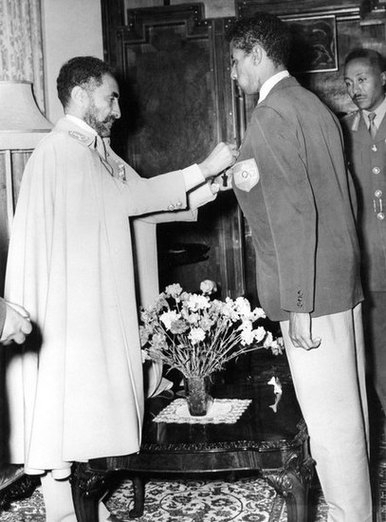 As a young adult, one could already sense his determination, as he decided to join the imperial guard, and walked the distance of 130 km separating him from Addis Ababa. Thereafter he started as a private guard. Soon after, he was spotted by Onni Niskanen, a Swede, who had been hired by the government to train athletes. He made it to the 1960 Rome Olympics as a replacement to Wami Biratu who had just injured himself. At the shoe-trial, Adidas, the Olympics sponsor, had very few shoes left, and none of them were comfortable to Bikila. In the end, Abebe Bikila ran the marathon barefoot in Rome’s cobblestone streets. He won the marathon in a record time of 2:15:16.2 improving the previous record by 8 min, thus giving Africa its very first gold Olympic medal. When asked why he ran barefoot, he said: “I wanted the world to know that my country, Ethiopia, has always won with determination and heroism.” The symbolic was huge, since there on the track course was the Axum Obelisk, which Mussolini had plundered away from Ethiopia… and 24 years later, Abebe Bikila, a small Ethiopian, from the imperial guard of Emperor Haile Selassie, marched over Rome and conquered! 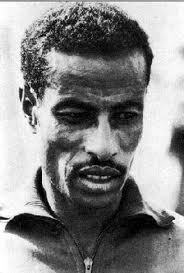 40 days prior to the 1964 Tokyo Olympics, Abebe was operated for an appendicitis. His sense of determination was so strong that he would train at night in the hospital courtyard, during the recovery. Once in Tokyo, Abebe Bikila set a new world record, 2:12:11:2, and won the race far ahead of the pack, and still full of energy. The police estimated that 1 million people lined up the streets to cheer Abebe Bikila. He was the first person in history to win a gold medal for the marathon back-to-back. Back home, Bikila was given a hero’s return by Emperor Haile Selassie and all of Ethiopia. It pains me to know that this great Olympian finished his life on a wheelchair. During the civil unrest of 1969, trying to avoid a crowd, he lost control of his car, and landed in a ditch. He was left paralyzed by the accident, as a quadriplegic. After several operations, his condition improved to the point where he was a paraplegic. While in wheels, Abebe’s competitive spirit and desire to see his country’s flag hoisted high and proud helped him compete and win several more races. In 1970, he participated in a 25 km cross-country sledge competition in Norway where he won the gold medal. Again, in the same tournament, he won a similar 10 km race where he was awarded a special plaque. Abebe Bikila died in 1973 from complications from his accident, 4 years earlier. His funeral was attended by more than 75,000 people, and emperor Haile Selassie proclaimed a national day of mourning for Ethiopia’s national hero. Newspapers throughout Africa eulogized him as an inspiration to their athletes and youths, some of whom won gold medals in future Olympics. A stadium in Addis Ababa was named in his honor. Please check out the website dedicated to Abebe Bikila, and this great article on Abebe Bikila on Ethiopians.com, and enjoy the poem written in praise of Bikila’s great heroism. The lines I liked were: Abebe Bikila, With you, Our dreams Never broken … The foot soldier Of forty years Led Ethiopians to run… And this said he in silence: We are the Ethiopians Whose lions made to sleep Need to run twice as fast!” … Running for Victory With that Abe’s Legacy. Yahoo had a really good article on him, while the The Guardian had a really good photojournal to honor Bikila’s life and legacy. 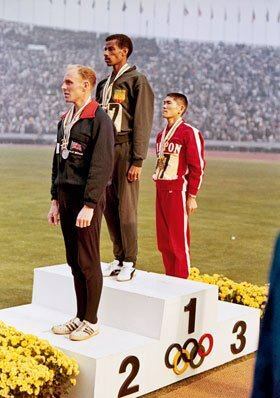 Lastly, click on this Facebook page and check out the movie Abebe Bikila made in his honor. Throughout his illustrious athletic career, Bikila had competed in more than 26 major marathon races. The world championships he won in 1960 and 1962 deserve special recognition, as well as the Osaka marathon of 1961. Bikila became the first runner ever to win two Olympic marathon gold medals, and the first African ever to win double gold at the Olympics. As the olympics approach, please remember this great African athlete who inspired so many, and was so determined that even as a paraplegic he still won gold medals.